Release Date: March 28th, 2007 (Film Forum) by Koch Lorber Films. The Cast: Pauline Malefane, Andile Tshoni, Lungelwa Blou, Zweilungile Sidloyi, Andries Mbali, Zamile Gantana, Andiswa Kedama, Ruby Mthethwa. Directed by Mark Dornford-May. BASIC PREMISE: Carmen (Malefane) woos Jongikhaya (Tshoni), a policeman, to prevent him from sending her to prison for injuring a co-worker at a cigarette factory. Based on the opera “Carmen” by Georges Bizet. ENTERTAINMENT VALUE: U-Carmen updates the 19th Century opera “Carmen” with no romantic chemistry and an awkward plot somewhat saved by very lively performances. 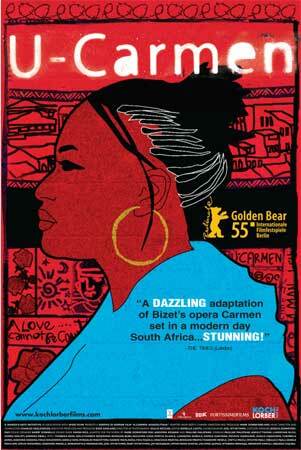 Pauline Malefane, who looks a lot like Queen Latifah, adds some charm to the role of Carmen, a worker at a cigarette factory who flirts with many men in Khayelitsha, a shantytown of South Africa. Carmen ends up in a fight in the factory, injures a coworker and meets her new lover, policeman Jongikhaya, whom she must stop from sending her to prison. Throughout most of the plot, they sing to each other, while in other scenes they merely talk, which feels rather awkward. The songs are actually sung by South African singers who belong to a theater company, but you would never have guessed that just by watching Malefane and Tshoni flawlessly fane the singing performance. The performances are rather dull when they just speak. Malefane shines the most during the songs, although she doesn’t come close to be being as awe-inspiring as Jennifer Hudson in Dreamgirls. Co-writer/director Mark Dornford-May makes with the low budget while including bright and colorful scenes in Khayelitsha, especially a beautiful aerial shot of the shantytown at the end of the film. Unfortunately, what’s missing from U-Carmern is romantic chemistry between Carmen and Khayelitsha, which any avid fan of the original opera would consider to be imperative in order to feel absorbed by the plot. Also, the film occasionally drags after the hour mark and, therefore, overstays its welcome at a running time of 2 hours. INSULT TO YOUR INTELLIGENCE: Awkward transitions between singing and talking. IN A NUTSHELL: Lively performances, especially by the charismatic Pauline Malefane, barely compensate for the plot which occasionally drags with awkward transitions between singing and talking and, worst of all, no romantic chemistry.